We are unable to acquire or re-stock this product. 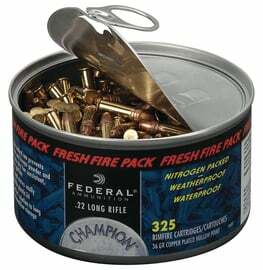 Each Fresh Fire Pack contains 325 rounds of 36 grain copper plated hollow point cartridges in a tough, nitrogen-sealed can that prevents corrosion and keeps powders and primers dry. Rugged, stackable construction. Resealable plastic lid. Weatherproof and waterproof for long-term storage. 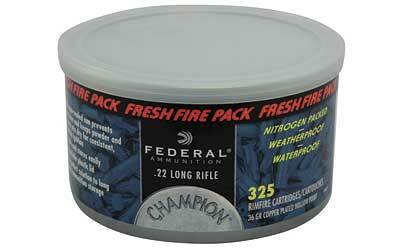 Reliable accurate Champion .22LR performance.